Wargaming celebrates Military Appreciation Month by teaming up with the American Veterans Organization (AMVETS) to bring you a limited-time bundle offer. One of America's leading veterans service organizations, AMVETS has an honorable history of assisting both veterans and active service troops through the sponsorship of a variety of programs. 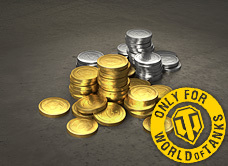 Beginning May 4 and continuing for the rest of the week, Wargaming will donate 25% of the proceeds from this bundle to the AMVETS organization. As we honor those who serve or have served, please consider donating to AMVETS!